Many pet owners wonder how many times a day they should be feeding their cats, and whether they should free-feed (make food available all day long) or have set meal times. The answers to these questions vary based on a cat’s age and circumstances. As a general rule, kittens under 16 weeks of age require at least 4 feedings per day. After 16 weeks, 2-3 feedings are sufficient. Many cat experts recommend free feeding while kittens are under 6 months of age. Wet food (or kitten mush for weaning kittens) can be put out at intervals, and a bowl of premium dry kitten food made available at all times. Most older adolescent and adult cats do well with 2–3 feedings per day, although finicky and underweight cats will usually be healthier with free feeding. Cats prefer free-feeding, and tend to eat 10–20 small meals a day if free-fed. However, veterinarian Ron Hines warns that 20%–40% of all adult cats that are free-fed an unlimited amount of food will become obese, so this is a risky strategy for cats that are not predisposed to being slim and active. Ultimately, the choice to free-feed or set limited feeding times should be based on the cat’s level of physical activity and whether he is inclined to grow chubby or stay slim. A good compromise for average to chubby cats is to fill the bowl with the day’s ration of dry food in the morning but not refill it whenever it becomes empty. In many multicat households, various cats have different feeding needs. One might be young and another elderly, one obese and another finicky and slim. In such cases, feeding cats in separate, closed rooms at fixed times is recommended. If feeding cats separately, leave food out for 20 minutes or so at each feeding and then take it away. Feeding cats separately provides the added advantage of enabling owners to easily detect when a cat has lost her appetite, which is often an early sign of illness. An alternative recommended by Drs. Foster & Smith is to put food for a kitten or skinny adult cat inside a cupboard or closet and secure the door so that it’s open just wide enough for the small cat to enter. This approach enables a kitten or underweight adult to be free-fed or given higher-calorie foods but prevents his chubby feline roommates from sneaking extra meals. During the second half of their pregnancies (the last 30 days or so), cats’ calorie requirements rise steadily and it becomes more difficult for them to eat large meals because of the increasing size of the kittens. It’s best to free-feed or provide many small meals in the later stage of pregnancy (the queen may need to eat every 3–4 hours). Mix increasing amounts of kitten food (which is higher in protein and calories) into the adult food until the pregnant queen is eating nothing but kitten food. Cats that are nursing kittens have even higher caloric requirements than pregnant cats. 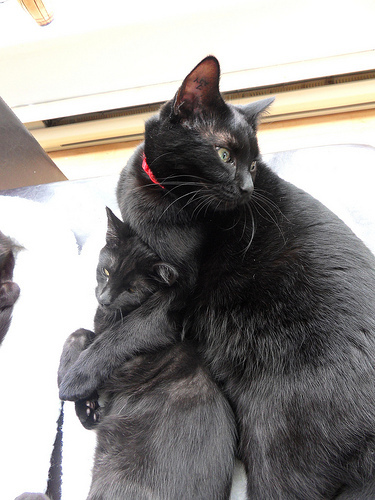 While nursing, mother cats should be free-fed and allowed to eat as much as they require. Some senior cats are obese, whereas others are underweight and have poor appetites. An overweight senior cat will usually do best with controlled portions at set times, but an underweight senior that is finicky or has a poor appetite is more likely to thrive on free-feeding. During routine check-ups, speak to the veterinarian about customizing a senior cat’s diet to her unique needs. For answers to common questions about feeding cats and kittens, visit the Cat Food page. For a full list of cat articles, see the main Cats page. Drs. Foster & Smith Educational Staff. (2010). “Cat Food: Feeding FAQs.” DrsFosterSmith.com. Hines, Ron, DVM. (2009). “What Should I Feed My Cat.” 2ndChance.info/catfood.htm. PetPlace Staff. (2010). “Feeding Your Cat – Canned or Dry and How Often?” PetPlace.com. Ruben, Dawn, Dr. (2010). “Feeding the Pregnant Cat.” PetPlace.com.